One of the biggest restrictions for gluten-sensitive people is breads and baked goods because of the origin of the flours used. If you have an intolerance or sensitivity to gluten (the protein that is found in wheat, barley and rye) you might find after eating a food or food product containing the gluten grain you feel lethargic, have stomach bloating, gas, etc. At one extreme is the one percent of the U.S. population that has Celiac disease, but experts estimate that as many as 10 percent have non-celiac gluten intolerance, or gluten sensitivity. However, only you and your doctor can determine this. So what do you eat? Well, it’s really what you don’t eat and that’s anything that contains this gluten protein! Trust me, it cuts out a lot of foods and what’s even trickier is that gluten is hidden in so many food products such as salad dressings and soy sauce— who would’ve thought? Being that it’s not a comfortable feeling to experience any gastrointestinal discomfort and/or other complications, I’m going to provide you a delicious recipe that you can still enjoy without the fear of gluten. In fact, you probably won’t miss the gluten packed version one bit! Today I’m bringing you Gluten-free Banana Choco-Chip Muffins! 2. Coat a jumbo 6-cup muffin tin with non-stick cooking spray and set aside. 3. In a mixing bowl, combine egg whites, bananas, applesauce, and extract; mix well. 4. 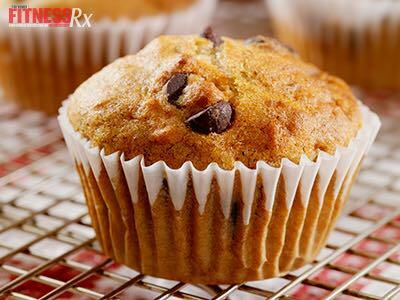 In a separate large mixing bowl, combine oat flour, baking powder, baking soda, salt, stevia, and carob chips. 5. Add the banana mixture to the bowl with the dry ingredients and stir until all ingredients are well blended and batter is formed. 6. Scoop your batter in even portions into the muffin tin. 7. Bake for approximately 25-30 minutes or until knife inserted in center of the muffin comes out clean and the tops are golden brown. 8. Remove from pan after about 15 minutes and cool on wire rack. Enjoy! !